Photo Martina Orsini. Windursfer left use no wand whatsoever to control flight. And those pushing for wands in small beachcats racing specifically, do not realize that current foiler As and even the FP are controlled in the same way, body trim mainly anlong sheet handling and steering. The F20 is a quite bigger/little bit heavier and do not react in the same way but still crew placement is key. That is the reason I see a future for this wand less type of foils for small cats, like the one used in the Eagle 20HF. 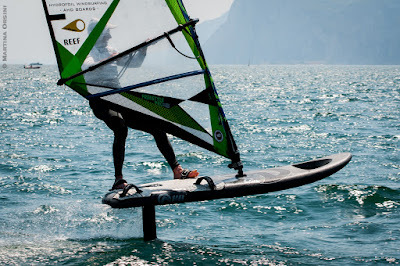 Below Foiling Week Day 2 report sent by Domenico Boffi. On the OD FP racing an open class will have more boats in the lineup and next year we might have a new foiling Formula Class being created. After 24 races, 10 presentations and 2 days of the most generous in terms of wind and weather that the Garda has given this season, Foiling Week is in full swing. “It is very good conditions here for the Flying Phantom foiling boats. Full foiling on the start, upwind and downwind. The lake is very flat and with a breeze of 17 - 18 knots its really good. Its not really easy in these conditions, you have a lot of rocking of the boat with me steering and my crew on the trapeze, we have to keep moving our bodies and work hard to get good speed. Racing was very close today, all the boats are very similar in speed, the difference is the control of the boat. Foiling is a new sensation for all of us but its really great.